The Rink Battle Creek welcomes you back to the Rink. Under new ownership, The Rink Battle Creek is now family owned and operated. With a deep desire to make quality ice time available to our community, regardless of age, background or capability. In a fun, safe and clean environment we welcome you to join us for a game, open skate, community event or sharpen your hockey or skating skills through an Open Skate or Sticks and Pucks practice time. ​Outside of Leagues, Association play or House Teams, The Rink Battle Creek welcomes you to join us for an Open Skate or sharpen you skills in a Sticks and Pucks Practice. ​Open Stake allows for individuals to rent skates and join in on the fun on the ice. Rental Skates are available from size 8 Toddler to size Adult 13. Skate Aids are available on the ice at no cost.. All skates, Ice Cleats, skate walkers and skate aids are first come, first serve. See our schedule for Open Skate and Sticks and Pucks times. Goalie Practice is a small group Coach lead practice that allows our youth goalies a chance to hone in their skills in addition to normal team practices. ​Cost per Goalie - $5. Sticks and Pucks allows for players to sharpen their skills on the ice in an open format, open practice environment. Helmets and gloves are required for all skaters. Be sure to check the schedule for age appropriate timing. While not required, an adult is always welcome to join their younger player during their Sticks and Puck scheduled times, regardless of age guidelines. ​​The Rink BC offers skate sharpening services. These are available during Sticks and Pucks practice times and evening practices on Monday, Tuesday and Thursdays. Services may be available outside of Sticks and Pucks, just ask and if someone is available and we will sharpen them right away. ​Pixie's proudly offers Coca-Cola products in our newly opened concession stand. Also available are chips, packaged candy, breakfast items, popcorn and more. The Rink BC is pleased to offer birthday party packages for all ages. Birthday Party Packages are available for parties during open skate, character visitors, private full rink birthday parties and more. A private heated community party room (The Bruins Den) is available for all scheduled birthday parties. You are welcome to decorate in the Bruins Den, but we must limit decorations to table top. Should you have a banner please ask a Rink Staff member to hang it. Please DO NOT hang anything on the chalk board wall. Includes 50 minutes of private use of the ice as well as skate rentals for your entire party. This skating is procceded by or followed by an hour long private use of the Bruins Den, our heated party room. Food and drink can be brought onsite. Early access for decorating can be coordinated. Includes access and skate rental for your entire party during a public skate. included is skate entry as well as skate rental and use of the Bruins Den for 50 minutes before, prior or during Open Skate times. 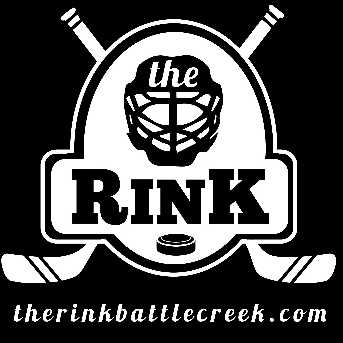 ​The Rink Battle Creek does not allow outside food on premise unless pre approved. Snacks for skaters, teams or our littlest fans do not apply. Outside Pizza. beverages, cupcakes, cake and or unapproved food items in the facility and or on the ice is prohibited. unapproved items wiil not be allowed on premise during Open Skate times. The Rink BC is pleased to offer several option for private parties. A private heated community room is available for all party rentals. Pricing varies on attendees and need. Packages and group discounts are available for groups greater than 75. ​The community room is heated and also available for meetings or non ice events. ​The Rink BC is excited to partner with local schools to offer private school skates. Please check our Rink BC calendar for your schools night and come ready to join your school mates for a night of skating at the Rink BC. ​The Rink BC would love to hear more about your fundraising idea and are excited at the prospect of partnering with your group or organization to host a fundraiser. Contact us today to share your idea or goal and lets work together to ensure your event success.